How Much Can You Save By Switching to Solar? Some people switch to solar panels to be more environmentally-conscious. Most people, however, are more interested in the cost savings. How much money can you really save by switching to solar? How long will it take for your solar panels to pay for themselves? Will solar panels add real value to your home? Today, we’re answering everything you need to know about saving money by switching to solar. The benefits of solar are obvious. You’re taking energy that already hits your house every day, and turning that energy into something usable. The only “downside” to solar is the upfront cost. Once you pay the upfront cost, the rest is profit. You can save a considerable amount of money every month by switching to solar. In fact, some people save so much money on solar that they sell energy back to the electrical grid. So not only do they save money using solar – they actually make money. More and more states allow you to do this. Ultimately, the average home will save about $600 to $800 USD per year. That number is based on the average electricity usage of an American household and the average cost of electricity in the United States. You can find some info online that shows even greater cost savings. 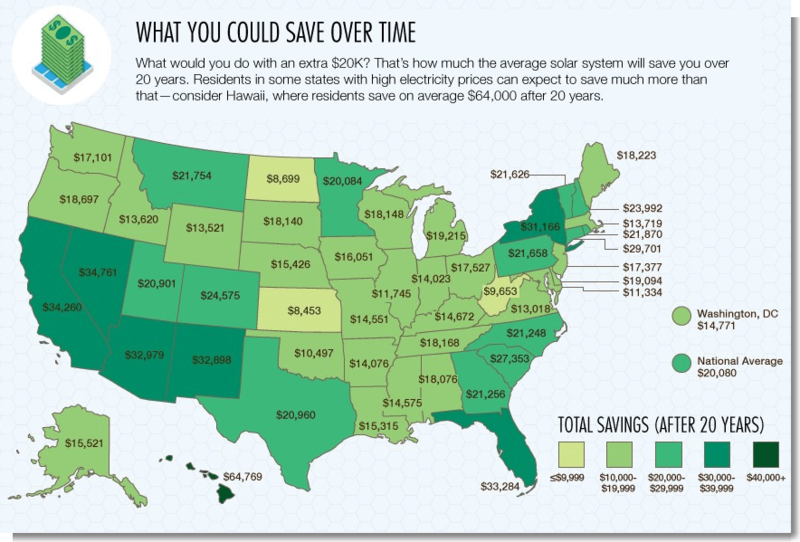 This map, for example, claims that residents of Hawaii can save $64,000 over a 20 year period from solar panels, while residents of California can save $34,000 and residents of New York can save $31,000. We’d love to tell you that every household in the world will save exactly $700 per year by switching to solar panels. Unfortunately, that’s not the case. The specific amount you save by switching to solar is impacted by a number of different factors. In some situations, your savings could be as little as $100 per year. In other situations, you could save $10,000 per year. Countries around the world offer tax credits for solar panel installation. Governments are incentivizing people to add solar panels to their homes. That means you can substantially reduce the cost of installation – which is your biggest expense. As you can imagine, these tax credits vary widely around the world. In general, sunny states like Arizona, California, and New Mexico, and sunny countries like Australia, are more inclined to give tax credits to residents for installing solar panels. Check DSIREUSA.org to find incentives across the United States. In some parts of the world, electricity is cheap and plentiful. Regions with existing solar infrastructure, wind power, or hydroelectric power may have cheap electricity rates, for example. In the United States, the average price for electricity is 12 cents per kilowatt hour (for perspective, an average household uses about 908 kWh per month in electricity). Idaho, North Dakota, and Washington have the cheapest electricity rates in the United States at around 8.0, 8.1, and 8.2 cents per kWh, respectively, while Hawaii has the most expensive electricity at 33.2 cents per kWh. The average US household would have a $73 electrical bill in Idaho – and a $300 electrical bill in Hawaii. Obviously, Hawaiians have more to gain from solar panels than people in Idaho. Internationally, electrical rates vary widely. Canada has relatively cheap electrical rates, with residents paying about 10 US cents per kilowatt hour. In Australia, they pay about 29 cents per kWh. In the EU, countries like Spain pay 30 cents per kWh, Germany pays 35 cents per kWh, and Denmark pays a whopping 41 cents per kWh. The average solar panel system clocks in at about 5kW. As you might expect, the cost of installation varies widely across the United States and around the world. In 2017, you can expect to pay about $12,000 for a 5kW solar system in Arizona and about $15,000 for that same solar panel system in Washington or Massachusetts. This is where you get to do basic math. Remember up above, when we told you the average US household can save about $700 on their electricity bill every year with solar panels? That means your solar system will pay for itself in about 20 years. In 2016, the average person paid about $3 per watt of installed solar panel on their home. A 5kW system, by the way, requires about 500 square feet of roof space. That may sound expensive – but solar panel prices have dropped 70% since 2006. The price of electricity has consistently risen over the past few decades. Most reports show that the cost of electricity rises about 3% per year – which is more than the average rate of inflation. That means the best time to invest in solar panels is right now. 5kW systems are particularly popular. They produce a reasonable amount of energy and they’re not overly expensive to install or maintain. You also don’t need an enormous roof. However, some people install systems as small as 3kW or 4kW, while others install systems as large as 15kW. If you can afford it, and you have the roof size, then larger solar panel systems will save you more money in the long run, all things considered. The cost of installation per kWh goes down when you’re installing more solar panels. So How Much Can You Really Save? Most reports show that you’ll save about $600 to $800 USD per year on your electricity bill by switching to solar. That number is based on the average price of electricity in the United States, the average electrical consumption of a household in the United States, and the average solar panel installation size. In reality, that number can range from $400 to $2000 per year for an average household in the United States – especially if you’re comparing an electrical bill in Hawaii with an electrical bill in Washington. Ultimately, most people agree that the math makes sense on solar panels – especially if you plan on living in your home for a long period of time and have extra cash available today. It’s a value-adding investment that is guaranteed to save you tens of thousands of dollars in electrical bills over a multi-year period.